Late last night I found in our mailbox a campaign piece that just knocked my socks off, even in today's world of unlimited billionaire-powered propaganda. 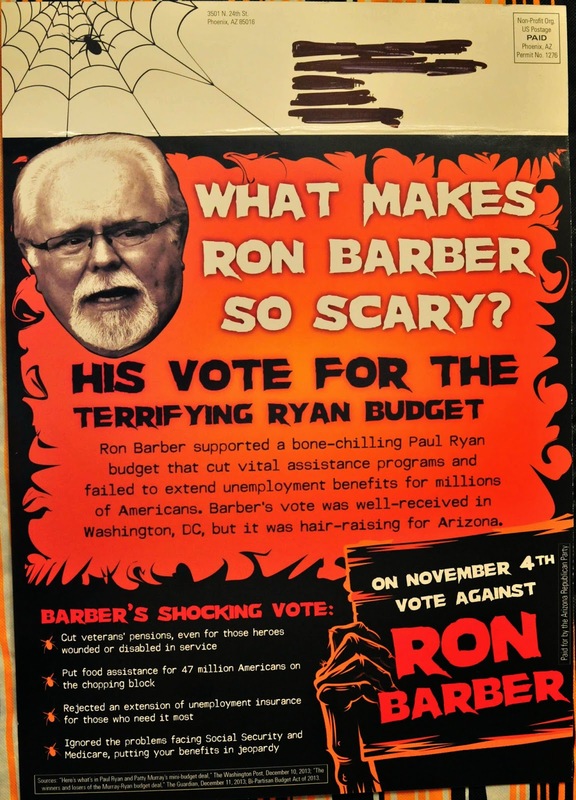 As you see above, the piece accuses Tucson Democratic House Representative Ron Barber (Gabby Gifford's old district) of voting for the Paul Ryan Budget, and how horrifying that budget is – their budget! I contacted Dylan Matthews of Ezra Klein's Vox about it, and he verified it, and now has a post up. It's like the fast food industry saying don't vote for Jack LaLane, he supports the junk food diet, with all the horrors of that diet. Instead, vote for the representative of the fast food industry that created and sells that diet! It's an astounding level of lying and Chutzpah, even by today's standards. For three years straight the Ryan budget passed the house 100% with Republican votes, not a single Democratic vote. For crying out loud, Paul Ryan was the Republican Vice-Presidential candidate last election! Update: I see it's now also up at Kevin Drum's Mother Jones' blog and Huffington Post. And from ABC Chief Whitehouse Correspondent Jonathan Karl, "About as cynical and misleading as it gets". University of Michigan economist Miles Kimball was kind enough to ask me to comment on a recent Twitter discussion he had with Berkeley economist Brad DeLong and Stony Brooke economist Noah Smith on Wallace neutrality. He was specifically concerned with how I would answer the question, Does Wallace neutrality result from (in theory) fiscal policy canceling out the Fed, or many private agents (the minnows) canceling out the Fed (the whale)? My answer, and more, is here. Am I taking crazy pills?! In 2010 I first asked publicly what I thought was a crucial question on health care, that I thought was not that unobvious, that no one was asking. Since then, I've periodically re-asked it (recently at Noah's), and not only has no one answered it, no one else anywhere ever asks it! I read widely and deeply the economics and politics blogosphere and other media almost every day, thousands of pages per year, from Paul Krugman to Stephen Williamson, the Atlantic, the New Republic, Fed websites, major newspapers, Jonathan Chait, Jonathan Cohn, the links in Economist's View, the links in the Plum Line, on and on. And no one, no one, ever asks it! Why? Why does no one else ask this?! With Miller Modigliani (MM), if the firm borrows more, it increases the overall debt level of its shareholders. Since we're assuming at the start that everyone's a perfect optimizer, with perfect expertise, public information, etc., and since we're assuming we start at equilibrium, then everyone is already at their optimal debt level, that they want to stay at. So, when the firm borrows more, the shareholders just borrow less, enough less so that their overall debt level remains unchanged. In MM, it's a partial equilibrium model, in that the interest rate is taken as given, exogenous, to use the term of the biz; the people in the model can't change it. But even if it weren't, the total demand for debt in the debt market doesn't change, because it all comes down to the fundamental demanders: the people. The firm is just an intermediary for them. The firm demands more debt? Well, they just demand less by an equal amount. Total demand in the market as a whole remains the same, and thus so would the market interest rate, even if this were a global equilibrium model. In Wallace's model, the government is like a big MM firm. And the citizens are shareholders of the government. When the government does the Wallace version of a QE, it basically is like it borrows more money (really lends, but let's look at the converse for now). That would make its citizens overall debt level higher than they like, so they want to borrow less by an equal amount to stay at their optimal overall debt level. The total demand for debt in the market remains unchanged. Government demand goes up by X, and private demand goes down by X, so the interest rate remains the same. In Wallace, all people are perfectly expert, with perfect public information, can do all analysis and information gathering and digesting instantly, at zero cost, and are perfect rational optimizers. They start the model in equilibrium with their optimal level of debt, and if the government, that they're "shareholders" in, borrows more, then they just instantly borrow less by an equal amount. So, interest rates don't change. More specifically, in Wallace there is a single consumption good. I called it C's. People save some of their C's for period two of their two period lives. The government's "QE" is to print dollars and exchange them for C's, which it will store for one period. Then it will sell all of those C's back again out into the market for dollars – with 100% certainty. That's their plan, everyone knows it, and they're going to stick to it. The people own the government. They're its shareholders; they get dividends in the form of government transfer payments, so when this government "firm" saves more C's, by selling newly printed dollars to get C's, and puts them into storage, then the people's overall savings goes up – up above their optimum that they had settled on in equilibrium. So they sell C's out of their private stores in an equal quantity to compensate. The total demand overall for the market to save C's for the future does not change, and so the interest rate doesn't either. And that's the thinking; that's why it works in Wallace's model. That's why you can prove no change when you do the math in this model. But why wouldn't this work in the real world? Well, first off, people are far from perfectly expert (especially in the super complex modern world), with perfect public information that they can gather, digest, and analyze at zero time, effort, or money cost. This should be like, duh, but then you hear some of the things some freshwater economists imply, and you're stunned. Partly to sell their ideology, partly to make the models they're top experts in more valued, partly, perhaps, just detached from reality from selling, and smelling, their own B.S. for so long. But for whatever reasons, obviously the vast majority of people are far from this. So, when the government "firm" starts to lend a lot more, almost no one thinks, MM style, or Wallace style, I want to start selling some of my bonds to compensate in equal measure as I see them doing that. And so total lending in the market does, in fact, go up, and market interest rates drop. People just don't react that way. And it won't be nearly enough if a savvy minority do. They won't control enough money to drive us to Wallace neutrality. It's like in Miller and Modigliani's model if the firms start borrowing a lot more, but the shareholders are mostly not really paying attention, and/or don't know well the implications, so, for the most part, they don't want to borrow any less to compensate. In that case, aggregate demand for borrowing would not remain unchanged. The aggregate demand curve for borrowing would, in fact, shift out, and the interest rate would rise. Other issues: In the real world there are a lot more different kinds of financial assets than just money, and borrowing and lending the single consumption good risk-free, like in Wallace's model. So, if the government does a QE in just some types of assets, people, even if they are perfect at optimizing, won't be able to funge their portfolios to relieve completely price pressure on those assets. Markets are not complete, and far from it, so that you could construct a synthetic for any asset. I talk about this in an earlier post on Wallace neutrality when I ask what if the government did a QE where they printed up a dollars and used it to purchase 100 million ounces of gold. Next, Miller-Modigliani irrelevance doesn't hold if investors face different borrowing costs and liquidity constraints than the firm. 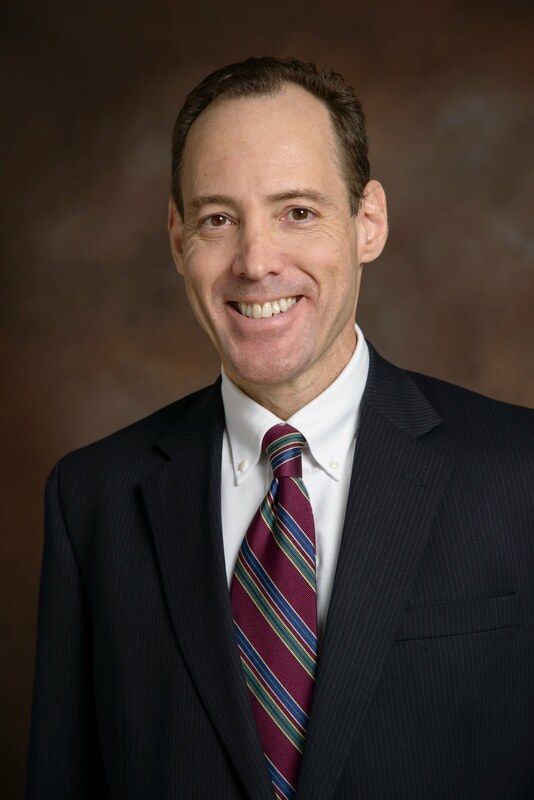 Likewise, Wallace irrelevance will not hold if individuals and firms face different borrowing costs and liquidity constraints than the federal government. Do they? Finally, Wallace's model assumes that with 100% certainty the central bank will completely reverse the QE one period later, and everyone knows this. All of the C's purchased with the newly printed dollars will be sold back. In the real world, investors cannot be completely certain a QE will be 100% reversed in the future. A wealth of evidence shows not just that quantitative easing matters, but also that qualitative easing matters. (see for example Krishnamurthy and Vissing-Jorgensen, Hamilton and Wu, Gagnon et al). In other words, QE works in practice but not in theory. Perhaps its time to jettison the theory. Always rule out all options but the two libertarian ones, Pareto and nothing, is value-free? Oxford macroeconomist Simon Wren-Lewis has a great post on how economics' extreme bias towards Pareto optimality is, of course, not value-free. I'll add this: You often hear from economists that Pareto optimality is value-free and no one can object to it because no one is hurt by the Pareto option. But here's the huge problem with that. What you're immediately doing when you say that is saying we will consider only two options, and rule out as unacceptable every other. We decide every other option is unacceptable except the two libertarian options, Pareto and nothing. THAT's value-free? That's positive and unideological? To rule out all of the many other options, including the utilitarian one, immediately as unacceptable, and only consider permissible for analysis the two libertarian ones? That's positive value-free? You can't even positively state, without endorsement, this is what the total societal utils optimum is, so people can know it and consider it? This is a source of extreme, pervasive, and profound bias in economics toward libertarianism, as well as plutocracy. And I discussed this in a 2012 post, which Simon cited. What else advances "one funeral at a time"? The title refers to a quote by the great physicist Max Planck, "Science advances one funeral at a time." I've been very interested in this quote for a long time, especially with regard to economics. But recently I've come upon and thought about some other important relevant areas. I'm currently reading "The Second Machine Age", by MIT business economist Erik Brynjolfsson and MIT computer scientist Andrew McAfee. This is their second book on the crucial subject of revolutionary computer/robot/machine capability, which is only just beginning. I'm especially interested in this subject due to my primary career in personal finance. It puts already hard to get job and income security at even potentially much greater risk in the future. So as a good personal finance expert and teacher, it's very important that I learn as much as possible about this issue, and how people can defend against it. Especially young people where there's still plenty of time and energy to gain the needed education and skills, and as well parents, so they know the important education and skills to promote in their children. That said, something recently really startled me on page 102. The authors talk about how electrification so profoundly increased productivity. It was the second great GPT (General Purpose Technology) after the steam engine. Yet, initially it did little for productivity, not until factory managers started to design factories for electrical rather than steam power. Electricity had the advantage that machines could be spread out and arranged in a horizontal, assembly line, pattern, as opposed to steam, where machines had to be placed close to the large central engine, both horizontally and vertically (on floors above and below the engine). The difference was profound, and revolutionized industrial productivity. Only after thirty years -- long enough for the original managers to retire and be replaced by a new generation -- did factory layouts change. It goes beyond what I said about second-order journalism; Rosen argues that there’s a value system at work, where being in the know about political maneuvering is considered all-important, whereas understanding the actual policy issue is for the drones. This shows the incredible value of the Ezra's and Chait's and Krugman's. But will we have to wait for the old generation of editors and publishers to die off before a new journalism based on substance, expertise, and non-misleading (as opposed to "Balance") can really take over? So this problem Max Planck alludes to appears to apply widely. There seems to be a significant danger of an entrenched and powerful older generation enforcing their status quo and refusing to allow or admit a new and better paradigm, despite strong evidence for it. The reasons? There are probably many. The older generation may not have the time or energy anymore to learn a new paradigm, so they certainly can be hurt by the old paradigm that they are top experts in, losing value. This can hurt badly both prestige and paycheck. And, people can become intellectually inflexible with age. It's something we have to watch out for and fight. But whatever the reasons, we don't want to have to wait for the funerals, or retirements. That's a horrible gratuitous cost to the generation waiting, and to future generations that will always be behind where they could have been had we not waited so long to move forward. I'm hopeful that the internet and the digital revolution will greatly speed positive evidence-based change, and they seem to be. But we all should be vigilant about this problem and willing to fight it, including in ourselves as we get older. There are some very important points here that aren't really being made, or very rarely, in the media, and politics and economics blogosphere. 1) The statistics you almost always see are per household, not per adult, or earner. For some of these quintiles, deciles, etc. you see a slight gain – over 30 or 40 years – but it’s per household, not per worker. To make only slightly more over a generation or more, and then it's only with now both spouses having to work to get it! This should always be talked about. It makes it much worse. You know how much more stressful it is to have to work long hours at work and then have to go home and work long hours on housework, cooking, and all these other things, because now both spouses are working. You know how much time and effort it takes to manage a household and raise children in this day and age, and now you no longer have one spouse who can devote all of his or her time and energy to it. And on top of that, parents are now substantially older, and so have less energy, yet far more total work – all for almost no increase in household income. In addition, your expenses are much higher with both spouses working, higher transportation costs, higher eating out and services costs due to lack of time, and so on. This alone can more than eliminate any small gain over a generation or two. Of course, probably most women want to have a career, but it's different to work a job because you want to, than because you have to, and then to only make about the same household money a family was making a generation ago without that income, so you have little or no extra money to hire someone to take up all of the housework that you now can't do when you're at your job. 2) It's not just average income, at all. It's the variance, the riskiness, of income – In finance, you hear non-stop about the risk-average return tradeoff, but when we talk about income inequality over time, it's typically only the average, never the riskiness. But this is such a big part of it. Families are so much more at risk today of unemployment and ruin. A point Harvard bankruptcy and financial distress expert Elizabeth Warren made so well is that in the early 1970's the typical family's basic fixed "must-have" expenses were only about 50% of their after-tax income, and with just one earner. Today it's about 75% with two earners, so just a 25% loss can send them over the edge (see this Senate testimony, especially page nine). And with two earners, the odds of a job loss are, at a first cut, twice as high. The long evidence and argument for the huge increase in financial riskiness is in Yale political scientist Jacob Hacker's "The Great Risk Shift", Warren's "The Two Income Trap", and the forthcoming, "Chasing the American Dream: Understanding What Shapes Our Fortunes", by a group of accomplished sociologists. For a brief summary of the last book, see this New York Times column by one of the authors. It's so much not just the average. It's also the risk. And this is just almost never said when income inequality statistics are stated or discussed. 3) So much less of the income of families' is available. First, a far bigger portion of it must be spent on education – and this is really largely a cost of business, a production input, not income. Families a generation ago used to be able to consume this money. Today, often $15,000/year or more is going to pre-school or day care for the kids that wasn't in 1974. And then there's all of the educational products and assistance, and I won't even get into the skyrocketed college costs, where college wasn't at all the necessity it is today. Take that out of the income and then tell me families in the lower -tiles have had a slight gain. Next, of course, medical is much more expensive. Obviously the care is more advanced, but still that takes away your day-to-day money, and adds to the financial stress. Control for that too, and then let's see how families are doing – an amazing 40 years later, when they should be doing far better with the power of compound growth, and given how amazingly the top earners have grown. I'll add one more, that I mentioned briefly above: Because both spouses are now working, often for very little more household income than 40 years ago, there's no one full time at home to cook and do housework, so now they have a much higher expense of eating out and prepared food. And transportation and other business costs are much higher to support two working spouses – Control for that too, and again, then tell me there was a slight gain in lower –tile households. 4) Historic income inequality brings all sorts of positional externalities and expenditure cascades of great cost, pushing families into much more expensive items than before, for often little or no intrinsic utility gain per item. And this has to be done on a household income that has gone up little, if at all, over more than a generation for the lower –tiles. These really do seem to me to be very important points that I rarely if ever hear, and it looks very misleading to me to leave them out. "That translates into revenues of a hundred thousand dollars per month, or $1.2 million a year." Many of these Wall Street Guys make that in less than a day. This shows you the incredible positive externalities of good journalism, and negative externalities of much of finance.